Wife got her bird Friday afternoon. She had been waiting to buy her tag depending on weather forecast for either 3rd or 4th. This weekend looked good so she bought her tag when she got off work Friday. Spotted a flock in one of the fields we had planned on hunting Saturday, so decided to give them a go. Snuck in position as started out showing them a fan and made a couple of yelps. That got their attention, and didn't take them long to come in. Hunt lasted 20 min from truck to trigger pull. Like our boys youth season bird, this one was double bearded also. Been having a heck of a time bringing the in. Problem was they were hanging up every time they would get to the crick. Noticed they were being pretty aggressive. The jake decoys weren’t enough to coax them in. So this morning I decided to throw the strutter out. Worked like money. They only way I knew he was come is the sound of him flying across the crick. Strutted a few times then made a B-line for the breading pair. The bullhead cut him off before he made it to them. Tagged out for the season feels good. Exact same spot I shot my bird opening morning. Came across this add tonight. 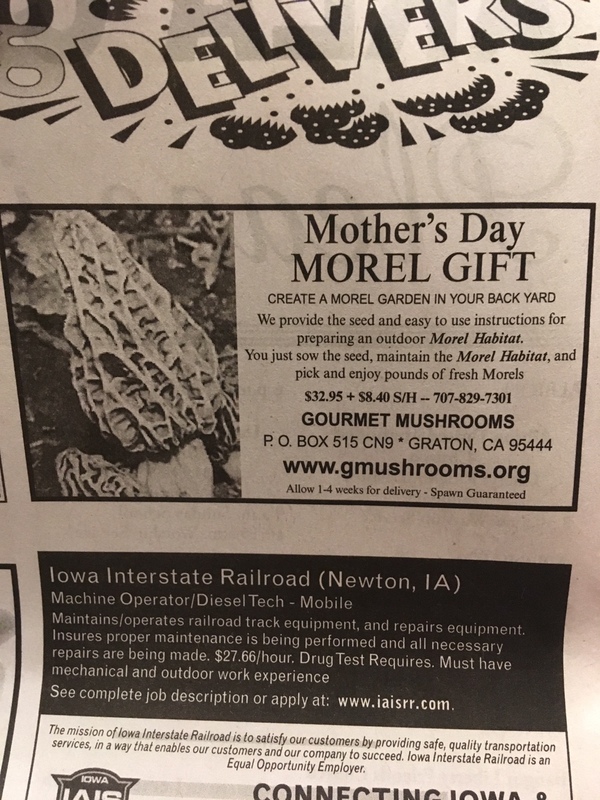 Can morels be grown and harvested like this? Tuesday night I hunted after work on the farm that I shot my turkey on Saturday. I arrived at 3:00 and as soon as I started putting up the DB a Tom was very close gobbling like crazy. I worked him for two hours and finally he let me see him as he walked to where I tagged the bird on Saturday. Later the same five toms were behind me with the hens and nothing I tried worked to draw them over. It was a fun hunt being covered up in birds all afternoon but frustrating dealing with hened up toms. This morning the alarm went off at 3:00am cause I was heading south to hunt with more cover in hopes of catching some loners that weren’t hened up. The blind was set up in a hay field tucked in a valley with hills behind me as to stay out of the wind. 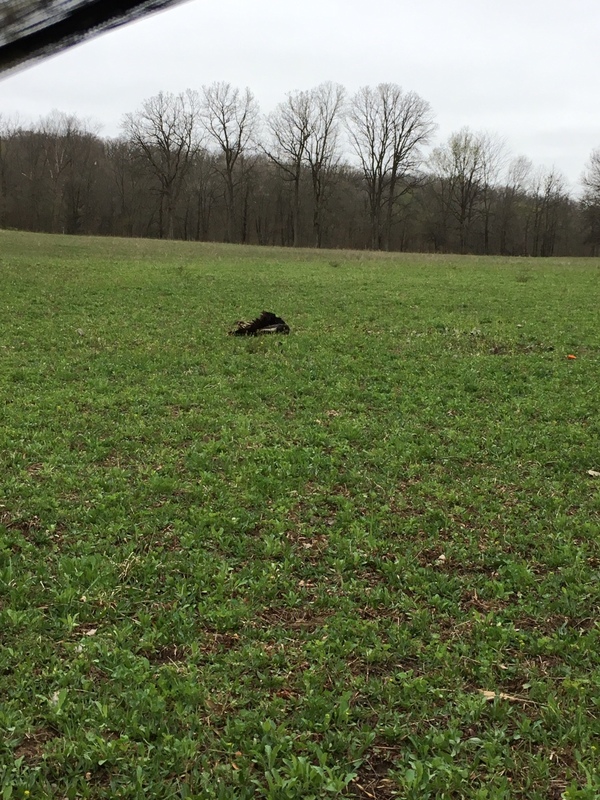 I only heard one gobble south of me which was down wind. Not long after my second series of calls two birds came threw the fence line from the south a Tom and a Jake. The Jake came in but was squirrelly but the video will tell the rest. Anybody drop coin on a custom box call? I've been using the same box call for 30 years but have always wanted a big "boat paddle" box call for some reason. Suggestions on makers?